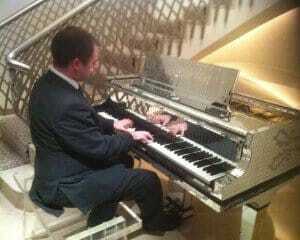 Looking for a party or function pianist? A pianist can add elegance and occasion to any party. Whether for a birthday, anniversary or dinner party, a pianist is a special way to put your guests at ease and create a sophisticated atmosphere for your event. Function pianist Simon Jordan has more than thirty years of professional experience behind him, and can provide piano entertainment for southern England’s finest hotels and venues. He has played at London’s Dorchester hotel and has played every year for the Prime Minister’s Christmas party at Chequers. Let Simon entertain your guests with his music! He has a stunning repertoire of ambient background music for special occasions including pop, jazz, swing, ethnic, light classical, West End and Broadway show tunes, and music for Christmas & the holidays. You can pick every tune he plays, or give him advice as to what to play – and what to avoid. One company CEO flew all the way from the US to hear him play ‘Dream the Impossible Dream!’. Simon’s clients have included BBC Radio, Daimler, Citibank, Barclays, Santander, WHSmith and Channel Four. From soft instrumentals to upbeat jazz, Simon will create the perfect ambience with his live background piano music. Relax in the knowledge that you have booked someone of the upmost professionalism to entertain your valued clients and guests. Simon Jordan has played for some of the UK’s most respected businesses, and is a repeat booking for many of them. Whether you want him to play for 15 minutes, or a few hours, Simon is cheerful and accommodating and will work with all the other professionals contributing to your party. Simon is a celebrated live performer who has graced the stages of some of London’s biggest concert halls as a soloist, had his own music performed at the Royal Festival Hall and toured Europe as a concerto soloist. For birthday celebrations, not only will you have someone there to play “Happy Birthday” and lead the singing, there’ll also be melodies galore that people of all ages will know and love. Simon Jordan has been delivering professional Christmas party piano experiences for private parties and corporate events for many years. You may select your own personal favourite Christmas songs to be played and discuss set timings, dress code or the hiring of a piano.